UARS was launched onboard Space Shuttle Discovery on September 12, 1991, as part of the STS-48 mission. It was deployed from Discovery’s Payload Bay, via her Shuttle Remote Manipulator System (SRMS), on Flight Day 3 of the mission (September 15). Discovery then returned home on September 18, landing at Edwards Air Force Base’s Runway 22. The satellite was the first multi-instrumented spacecraft to observe numerous chemical components of the atmosphere for better understanding of photochemistry. 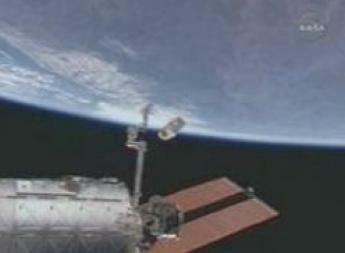 UARS data marked the beginning of many long-term records for key chemicals in the atmosphere. The satellite also provided key data on the amount of light that comes from the sun at ultraviolet and visible wavelengths. UARS – which is 35 feet long, 15 feet in diameter, and weighs 13,000 pounds – ceased its productive scientific life in 2005, whilst on its orbit at an altitude of 375 miles with an orbital inclination of 57 degrees. It was originally designed to operate for only three years. Now out of fuel, the satellite has been dropping out of orbit, and is expected to re-enter around September 23. The problem is, NASA aren’t sure where it will re-enter until next week, which has gained media attention, given experts believe at least 26 large pieces of the satellite are expected to survive re-entry. All NASA know at this point is the satellite will re-enter somewhere between the latitudes of northern Canada and southern South America. While the hope – via probability – is any surviving pieces of UARS will impact over water, it highlights the need to work a level of mitigation into other returning objects from space. The timing of the UARS re-entry comes shortly after NASA’s FOIG team held a Special Safety Topic review into the hazards posed by space hardware fragmentation during re-entry, with the aim to apply mitigation to any potential risks from hardware breaking up and surviving entry – in turn threatening human life on the ground. “As we progress forward with future programs, we should keep in mind that in systems engineering the definition of a System Life Cycle includes not just deployment and operation but also retirement and disposal,” a presentation from the meeting (available on L2) noted. 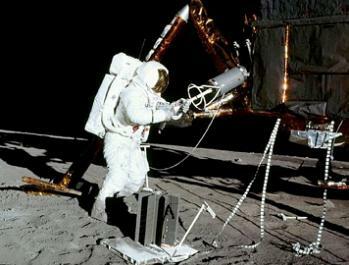 Several examples of hardware entering and surviving the extreme heat and aerodynamic stresses – which usually destroys returning hardware – are cited, starting with Apollo 13’s Lunar Module in April, 1970. “The Aquarius LEM re-entered Earth’s atmosphere after having served as a lifeboat for the Apollo 13 crew. Mounted on the LEM descent stage, was a SNAP-27 (System For Nuclear Auxiliary Power) RTG (Radioisotope Thermoelectric Generator) which contained 8.3 lbs (3.9 kg) of Plutonium-238,” noted the presentation. The second example overviewed also had a nuclear element of concern, as the Soviet COSMOS-954 satellite failed to safe itself prior to returning back to Earth in 1978. “COSMOS – A Soviet surveillance satellite that used a nuclear reactor for power (~50 kg of Uranium-235). By design, at the end of the satellite’s life, the reactor was supposed to separate and be boosted to a high parking orbit. The presentation also notes that in 1983, COSMOS-1402 landed in the Indian Ocean, while in 1988, COSMOS-1900 landed in the Atlantic Ocean. The third example shown related to the US station Skylab, which had originally hoped for an orbital reboost from an early space shuttle mission, prior to an eventful re-entry in July of 1979, which resulted in large pieces of hardware surviving. “Increased solar activity, along with shuttle delays prevented any possibility of a reboost of the 90.6 ton space station. JSC (Johnson Space Center) controllers commanded Skylab into a tumble, hoping this would increase the amount of disintegration upon re-entry. 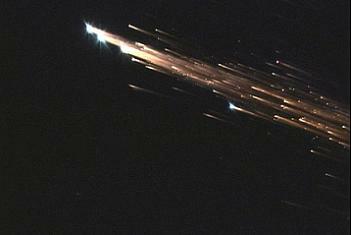 The Russian’s own space station also suffered the fate of re-entry, as MIR saw its life ended in 2001. However, while a lot of pieces of the station survived, all the hardware followed a pre-planned disposal corridor over the southern Pacific Ocean. “After a 15 year on-orbit life, the 135 ton orbital complex, was intentionally de-orbited by firing the thrusters of the attached Progress M1-5,” added the presentation’s overview. 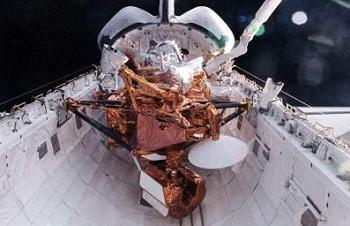 Other examples include an incident during Columbia’s STS-75 mission, when the Tethered Satellite System (TSS) was to be deployed to a distance of 12 miles to place the TSS into the rarefied electrically charged layer of the atmosphere known as the ionosphere. 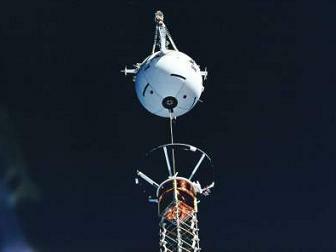 As described in Chris Gebhardt’s superb overview of Columbia’s service and missions, it was hoped that the TSS would generate high voltage and electrical currents as it moved through the ionosphere and across the magnetic field lines of Earth. This, in turn, would allow scientists to learn more about the electrodynamics of a conducting tether system and to deepen understanding of physical processes in the near-Earth space environment. Deployment of the TSS proved successful at first. But just before the TSS reached full deployment, the tether snapped and the TSS was lost. It remained in orbit for several weeks before finally re-entering Earth’s atmosphere. 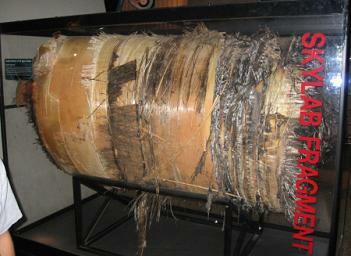 “During the STS-75 mission, with the TSS at 19.6 km (of a planned 20 km deployment), the tether broke due to a break down in insulation, short and subsequent melting of the cable,” added the presentation. 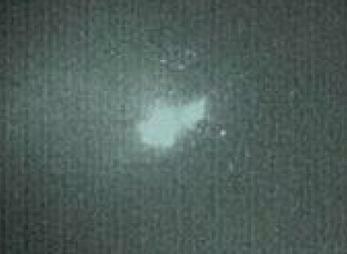 “At this point the 518 kg TSS became a free flying satellite (trailing a very long tail). While the satellite and tether did not pose a hazard to the ground, there was pre-flight concern that should the tether break, it could pose a re-contact risk to the orbiter. Tragically, Columbia herself provided the next example, after she – and her crew – were lost over east Texas during the ill-fated entry at the end of her STS-107 mission. 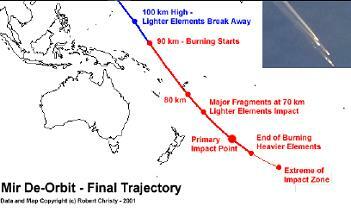 Her loss resulted in additional work on computer models related to the mitigation of public risk for spacecraft debris. The final example cited was USA-193 – also known as NRO launch 21 – was a military spy satellite launched on December 14, 2006 – the first launch of the then newly formed United Launch Alliance (ULA), via a Delta II launch vehicle. Unfortunately, the satellite malfunctioned shortly after deployment,and was intentionally destroyed 14 months later on February 21, 2008, by a modified SM-3 missile fired from the warship USS Lake Erie, stationed west of Hawaii. “Shortly after launch, all communication with a 5000 lbs, classified, US experimental radar reconnaissance satellite, was lost. The decision was made to destroy the satellite to prevent larger pieces from reaching the ground,” the presentation noted. “The primary reported concern was contamination should the onboard hydrazine tank survive to the ground. A secondary concern was the classified nature of any hardware that did make it to the ground. As NASA aim to control debris both in space and from surviving entry, the presentation noted that the International Space Station (ISS) has provided additional insights – from the standpoint of what they jettison from the orbital outpost. “As the ISS program progressed, it became apparent that there needed to exist a standard policy for the jettison of hardware. 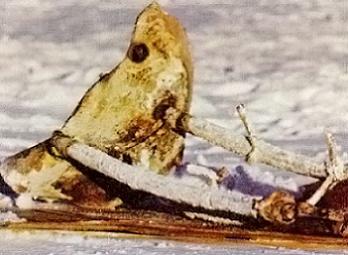 Reasons for jettison could include: Safety issue for return (contamination, material properties, etc.). On-orbit stowage return manifest. EVA timeline savings. Hardware is designed to be jettison (ex. micro-sat). As noted in flight rules (FR B4-104) for jettisoning hardware, “Whenever possible, hardware will be jettisoned from the ISS in a retrograde direction.” This allows controllers on the ground to analyze the expected relative motion, and ensure the jettisoned item cannot pose a collision hazard to ISS. 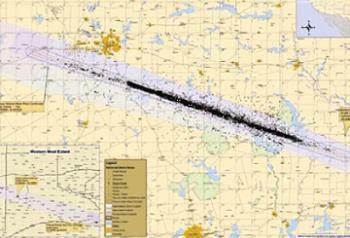 USSTRATCOM are notified by NASA – and if available, a state vector provided. NASA managers now find themselves having to be vigilant to provide mitigation of hardware risks, with several current vehicles designed to end their lives in the fire of re-entry. Managers will also have to apply such planning for future vehicles, not least the fleet of new vehicles, such as SpaceX’s Dragon, and NASA’s own Orion (MPCV). “ATV (ESA), HTV (JAXA) and Progress (Russia): End of mission disposal is via atmospheric re-entry. Soyuz (Russia): While the Descent Module re-enters and is recovered, support hardware is jettisoned (ex. Orbital Module and Instrumentation and Science Module),” added the presentation. According to the Special Safety Topic meeting’s findings, the key to providing additional mitigation against risks to the public will be found via improving computer models on how hardware is expected to disintegrate during entry. On the whole, no risks are associated with re-entering vehicles, given the tight pre-planned disposal corridors. The mitigation – however – will provide a safety net for those vehicles which may suffer an issue and an uncontrolled re-entry.